Want SLAM! at your school? Check out our current university and school partners and help bring SLAM! to your school! Teach the class you are most passionate about and learn how to effectively manage your classroom. Build lasting relationships with students in your class and other passionate SLAM! teachers. College is a busy time, but SLAM! gives you a chance to stay musically involved throughout college. SLAM! 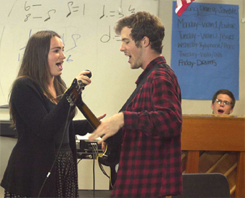 teachers feel a great sense of accomplishment seeing their students develop as musicians. To get involved, check out our University Partners!